An investigative report detailing the causes of an August explosion at Russia’s biggest hydroelectric plant cites systemic management and engineering problems as at fault for the incident that killed 75 workers, reports Kasparov.ru. Yuri Lipatov, secretary of the parliamentary committee that produced the report, said at a December 21 press conference that a turbine in the Sayano–Shushenskaya hydroelectric plant exploded due to an uncontrolled, excessive vibration and the lack of a mechanism that could have automatically shut the unit off. The report, which details the chain of events that lead to the proper safety precautions to be missing, revealed oversight failures on a number of levels at the plant. Foremost, said Lipatov, was the installation of new equipment that could raise an alarm in case of an emergency, but was unable to make the turbine stop – a move that the plant’s management had disagreed upon with the head engineering contractor. The report also blamed the incompetence of the council of directors, who apparently lacked the appropriate education for their positions. The investigation found that on the day of the explosion, a worker had informed his supervisor that one of the turbines was working incorrectly. The plant’s management had already been aware that the turbine in question was 29 years old and only had two months of guaranteed operational ability left. The parliamentary report calls for the management of the power plant, its general director, the head engineer, and a list of others to be dismissed from their posts and brought to responsibility for the accident. A report by Rostekhnadzor, a federal organization supervising technological and other issues, had previously been released in October. Lipatov said, however, that the reports differ insofar as Rostekhnadzor offered more of a line-by-line rundown of events, while the parliamentary report examined its causes, development, and impact analysis, and provided recommendations to prevent similar incidents. 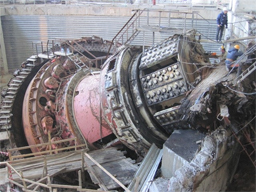 The Sayano-Shushenskaya hydroelectric plant in southern Siberia was ripped open on August 17, 2009 when the explosion of turbine No. 2 caused massive flooding that quickly overtook the plant. 75 people were killed and 13 injured as a result. A complete restoration of the station is expected to take several years. Security camera footage of the flood can be seen by clicking here.